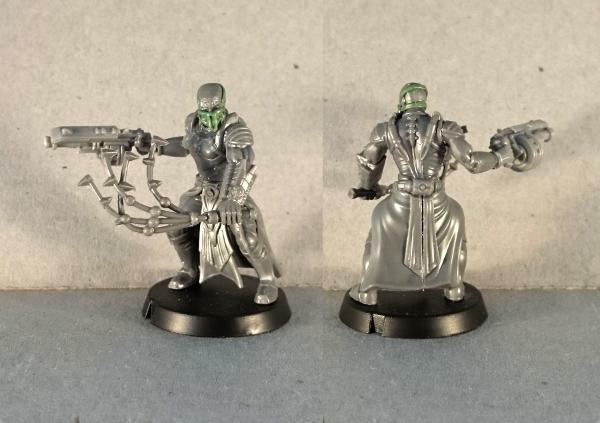 I've previously shown off a couple of conversions built to represent Karist Angel Keepers - a HQ unit that is currently in development and intended to offer a different way of playing Karist forces, by giving them access to an army potentially made entirely (other than the Keeper, of course) out of Angels. 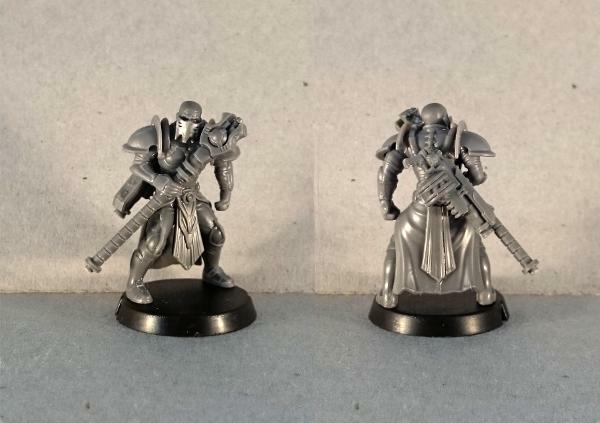 The conversions garnered a fair amount of interest, so I thought I should put together a brief run-down on how to do it. 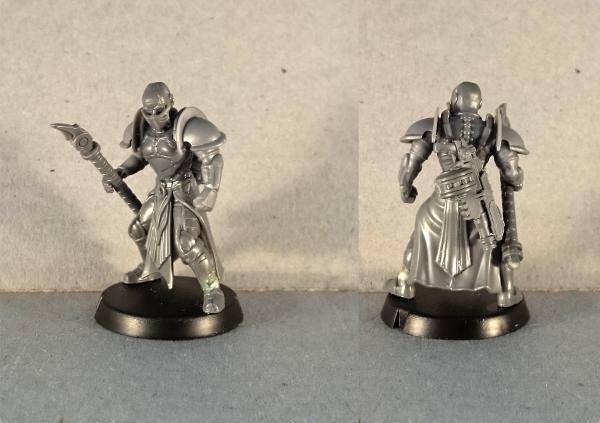 Of course, nice conversions are all well and good, but you also need rules to use them. So as an extra bonus, I snuck into the rules development vault and purloined an early playtest version of the Angel Keeper's unit card, which you can download as a PDF here. 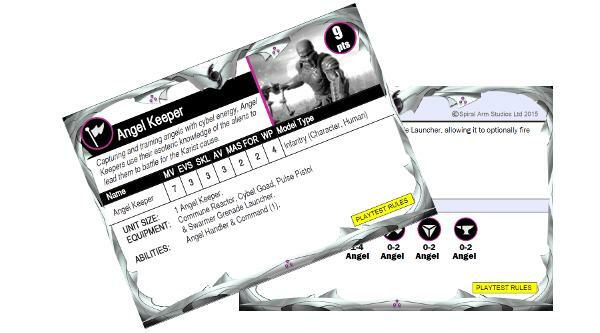 The PDF includes two cards: The Angel Keeper unit card, and a 'companion' card that includes new rules that apply to the Keeper. The rules on both of these cards are 'Playtest Rules', meaning that they're rules that are still being worked on, so you should ok it with your opponent before using the Angel Keeper in your games. Once the development process has been completed, the rules on the companion card will be rolled into the normal rulebooks and a final version of the unit card will be issued. Obviously, the Keeper's force roster isn't yet as complete as it could be, because there are currently only the two angel kits - Minnows and the Mature Angel. 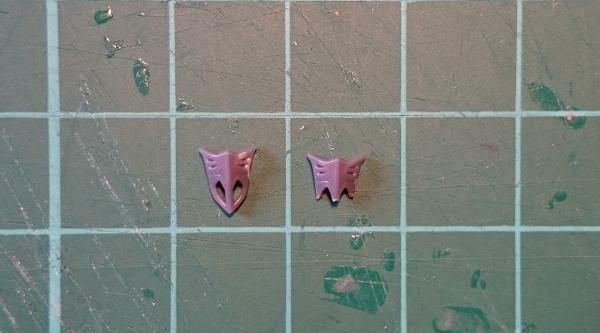 Rest assured there will eventually be more unit options (and the associated model kits) to fill those other slots! *Yes, that's totally the official designation for it. 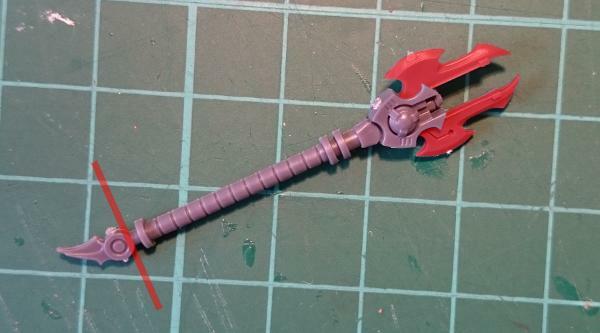 Assembly is mostly fairly straightforward: Build the legs as you normally would for the Kaddar Nova. You can create a slight visual break from the Nova by trimming off the bottom-most layer of the tabard, so it looks slightly less fancy than the Nova's if you like. 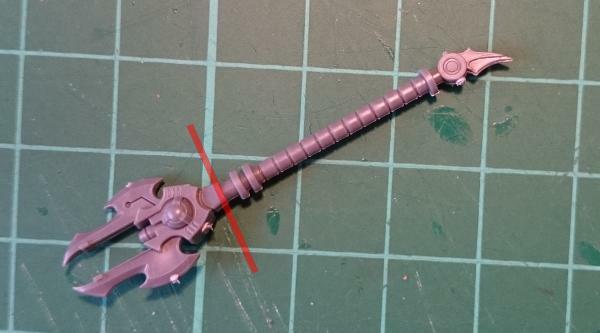 Assemble and glue on the torso and the head. This is then glued in place with the former peak pointing downwards over the Keeper's nose and mouth. To give it a slightly better fit, slice off the Keeper's nose and if you're using a Kaddar Nova head (which is slightly more gaunt than the Trooper heads) it can help to make the mask a little more curved - hold it upright between your thumb and forefinger and give it a gentle squeeze to bend it very slightly, and then glue it in place. The Angel Keeper is armed with a Cybel Goad, which he uses to encourage the angels in his charge to do as they're told, and also to whallop nearby enemies when the need arises. I envisaged the goad as potentially taking various forms depending on the preferences of the individual keeper - So some may use a staff or prod, others a whip or lash of some kind, or something else entirely. This opens up all sorts of modeling possibilities, but I'll show a couple of relatively easy options that I've come up with so far. I picture this goad having a small cybel cannister in the round part behind the spike, which distributes a tiny jolt off cybel energy along the spike when it comes in contact with something. This one is more of a taser-style unit, still requiring contact to use and administering a small cybel charge directly to the target rather than along a blade or spike. I have this one coiled up to hang on the Keeper's belt. The coiled guitar string is bound with a little fine copper wire to keep it together. 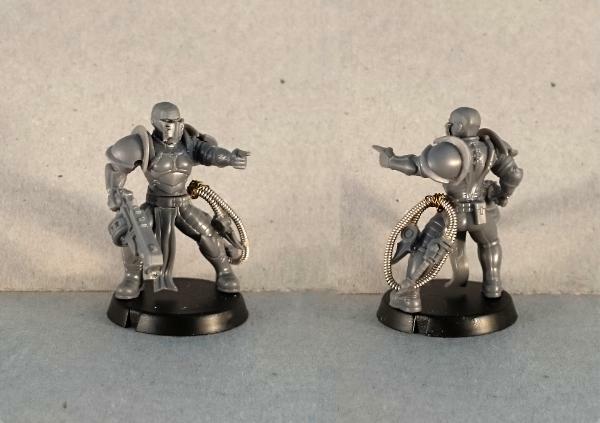 If you want your Keeper to have his grenade launcher in hand instead of his goad, the easiest option is to use the grenade launcher from the Trooper sprue instead of the Expansion sprue version, as it has the firing hand attached. For a single-handed grip, just slice or file off the support hand from the grenade launcher's stock. 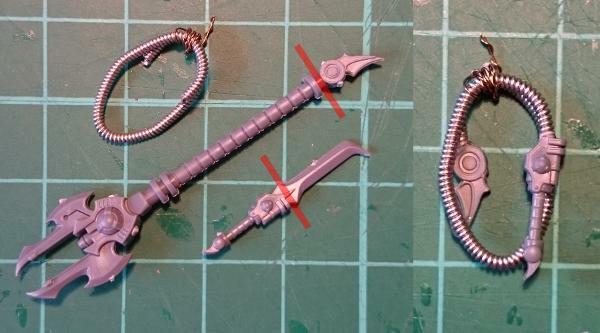 The pistol arm on the trooper sprue is nicely positioned out to the side for the grenade launcher - just cut off the pistol hand at the wrist, and glue the grenade launcher hand in its place. 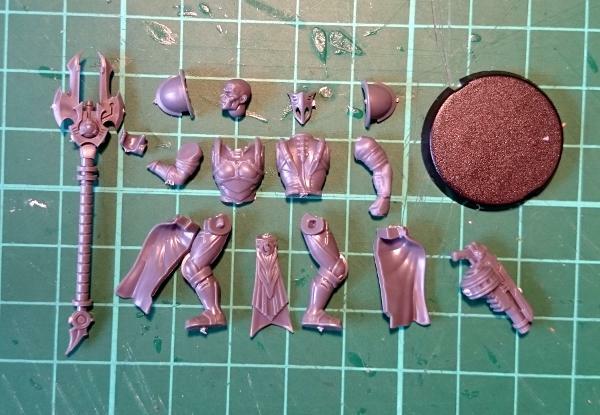 For the Keeper below, I have also used Shadow Walker legs with an Expansion sprue loincloth, instead of the Nova legs. This is an easy way to give your Keeper a slightly more dynamic pose or to make him slightly less austentatious. You can pick up the parts you need to build your own Angel Keeper from the Maelstrom's Edge online store (www.maelstromsedge.com - You'll need the Kaddar Nova, Shadow Walker, Karist Trooper and Faction Expansion Sprue, which will build you an Angel Keeper and because of all of the extras on the sprues will still leave enough spare parts to still build a Kaddar Nova, a Shadow Walker and a unit of Karist Troopers or Praetorians. We would love to hear any feedback you have on the Angel Keeper's rules, and see how everyone is building their own keepers, so please share your creations, questions or comments on the Comm Guild Facebook page (https://www.facebook.com/groups/MaelstromsEdge)!